The pet food market is always swamped with new brands and products popping up every day so making a choice based on factors such as nutritional value, affordability, and others can become challenging and that’s why we are introducing two of the most popular pet food brands, Hill’s Science Diet and Royal Canin that have created a name for themselves. These brands are our area of focus for this segment not just because they are both aesthetically pleasing, but because they are also very nutritious and delicious. Within the course of this article, all your questions about dog and cat diet will be answered. you will also learn how to pick the best pet food brand for your pet. So what are we waiting for? let’s begin! let’s have a little faceoff to compare both brands to ascertain which one has more nutritional value and best suits your dogs and/or cats at various stages of life. After you are done with this awesome comparison check out Hills Science Diet and Royal Canin here to see the different flavors and pricing. Royal Canin has more protein than Hill’s Science Diet across most food type while Hills Science Diet leads on dry cat foods. Dry cat food of Hill Science Diet has 1.8% more protein than the Royal Canin dry cat food. 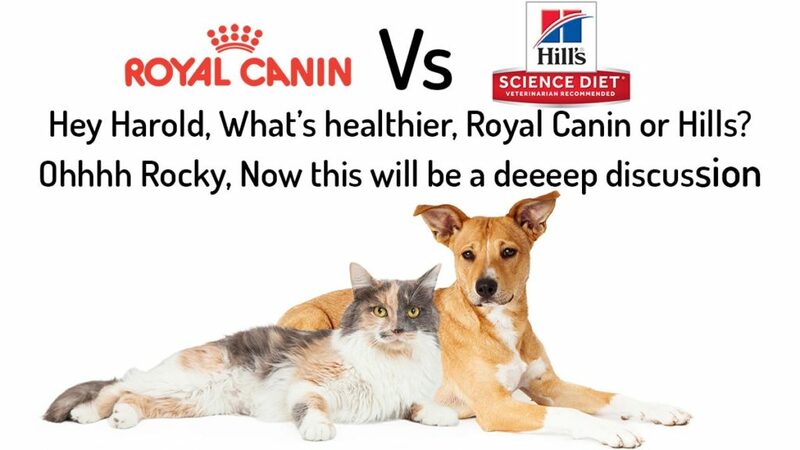 Hills Science Diet is cheaper, whereas Royal Canin is still considered to be quite affordable. Which one has received more recalls? The Hills Science Diet brand has been recalled just once whereas the Royal canin has had three different recalls since its inception. These brands have so many variants to offer, the 3 categories of food types are wet foods, dry foods and treats. Royal Canin has 273 recipes in total and over 100 of those recipes are devoted to only dry dog food. It seems the Royal Canin brand favors our canine friends a lot but then same can be said for the Hill’s Science Diet that uses 50 out of its 137 recipes for dry dog food formulations only. However, both brands have a good number of variants for cat foods as well as treat which is great for highly selective pets with a sensitive digestive system. Food is a major aspect of pet care and as such getting the nutrients that is just perfect for your dogs and cat is very vital. To achieve this goal, every pet owner needs to understand fully the nutritional needs of their pet because our pets have varying nutritional requirements, feeding styles and responses. The nutritional value of every pet food is expressed by its nutritional content. A guaranteed analysis of the nutritional content of any pet food is clearly spelt out on the label of the pet food product as demanded by the Association of American Feed Control Officials (AAFCO). The analysis provides the guaranteed percentages of crude protein and crude fat, and maximum percentages of crude fibre and moisture. It is important to carefully study and understand this information if you want your pets to have meals that nourish and boost their immune system while mitigating every possibility of infection. Proteins are essential nutrients in every pets’ diet and can be obtained from meat such as chicken or beef. They are so important in a pet’s diet that the entire physiological functioning of the canine and feline body system depends on it. The percentage of protein required by dogs and cats depends on their species, life stage and activity level, as well as the quality and digestibility of protein in their food. Cats generally require more protein because of their protein metabolism differences. Royal Canin has more protein than Hill’s Science Diet for all foods except for dry cat food. Fats are concentrated forms of energy. Dietary fats are either plant or animal-based fats that supplies the body with essential amino acids such as omega-3 and omega 6. Fats are not only required for the proper development and functioning of body cells, tissues, nerves and muscles but also a healthy reproductive system in dogs and cats. Hill’s Science Diet provides more fat than Royal Canin across all foods except for dry dog foods where it offers 0.6% less fat than the Royal Canin dry dog foods. The Royal Canin brand provides significantly high amounts of fibre compared to the Hill’s Science Diet brand. Not only do the bags or cans of pet food come in different sizes, but their costs also vary greatly. If you are a pet owner on a very tight budget (especially if you have large breeds or multiple dogs and cats), but also do not want to purchase extremely cheap, poor quality pet food. Here’s a tip – read through the nutritional value of the product and use the average cost per calories or average cost per pound of the product instead of the price written on the price tag of the product. This would give you an exact estimate of how much you are likely to spend on pet food periodically. Here’s a tables showing the price comparisons between the Hill’s science diet brand and the Royal Canin. There is little to no difference in the prices of both pet food brands, however, Hill’s Science Diet looks cheaper. Both brands have so many flavors resulting from the ingredients they use for their recipe formulation. Royal Canin is an exceptional brand with so many recipes. This brand uses premium quality chicken by-product meal, brewers rice flour, brewers rice, corn, wheat gluten, chicken fat, corn gluten meal, natural flavors, dried plain beet pulp, fish oil, vegetable oil and others. Check out the current Hills Science diet and Royal Canin recipes here. Hill’s Science Diet is a pet food brand that has been committed manufacturing clinically proven dog and cat food since its inception in the 1960s. It is owned by an American based company called Colgate-Palmolive whose headquarter is at Topeka, Kansas, United states. Some of the brand’s product include Hill’s Canine Sensitive Stomach Dog Food, Hill’s Canine Healthy Mobility for large dogs, Hill’s Canine Healthy Mobility for medium-sized dog, etc. This is a pet food brand that produces and distributes dog and cat foods worldwide. The brand was established 51 years ago by a French veterinary surgeon, Jean Cathary and its presently owned by Mars Inc. The brand is famous for its Chihuahua puppy dry foods, Boxer Adult Dry food, Pro Adult Dog food, amongst others. From the information and analysis reported so far, both brands are really great product but Royal Canin has a bit more edge as “brand of choice” when it comes to Nutritional values, that is if you do not mind spending a little more than you budget for pet foods.